The alienation of the immigrant experience is a common narrative device in cinema. Whether it’s a young Vito Corleone glimpsing the Statue of Liberty for the first time in The Godfather: Part II or the Mexican illegal immigrants at the center of A Better Life, the prospect of finding a future in a far away land can only end in tragedy, according to the movies, anyway. It’s also a trope often solely seen through masculine eyes, where young men risk everything to escape from their homeland for a better life. 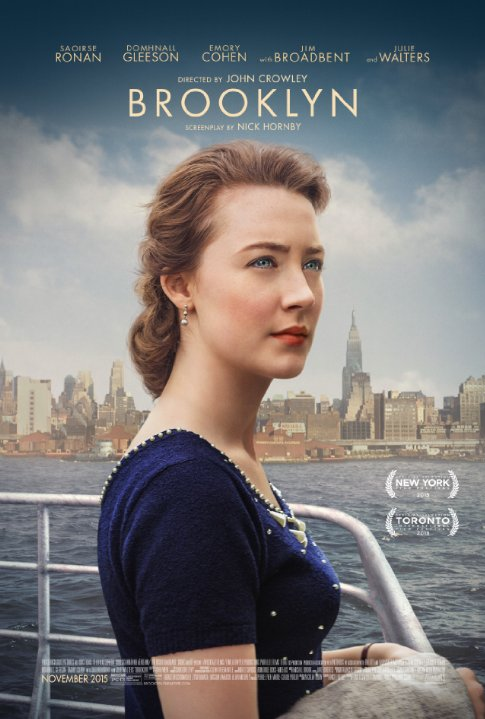 This is where John Crowley’s new film Brooklyn differs, giving us a female protagonist whose future is shrouded in both tragedy and hope. With the current immigrant crisis in Europe and the most terrifying anti-immigration presidential candidate in the form of Donald Trump, Brooklyn, with it’s positive spin on the immigrant experience, could not have come at a better time. But our protagonist in Brooklyn isn’t a Syrian refugee or a Mexican looking for a better life. Our hero is a 22-year-old woman escaping from her dreary, dull life in small town Ireland. Set in 1951, Eilis (Saoirse Ronan) finds her life is going nowhere, working part-time in a grocer and busying herself attending social dances. She is encouraged by her older sister Rose (Fiona Glascott) to travel to America where she will have more job and life prospects than in their tiny Irish village. After arriving in Brooklyn, Eilis settles into a boarding house with fellow Irish girls, run by strict but caring landlady Mrs. Kehoe (Julie Walters virtually playing herself), and gets a job in a fancy department store where she is so painfully shy that she can barely speak to the customers. Sponsored by fellow Irish immigrant, Father Flood (Jim Broadbent), she also attends night classes in bookkeeping, dreaming of becoming an accountant like her older sister. Eilis soon finds a chance of love in America when she meets Italian plumber Tony (Emory Cohen), with whom she forms an immediate and close bond. However, when family tragedy strikes back home, Eilis is torn between her two very different worlds, finding herself unsure of which one she belongs in. Travelling back to Ireland, she feels alienated, but can’t help but consider staying for the sheer comfort of home – and the prospect of her alternative love interest, Jim (Domhnall Gleeson). Like the other recent, exquisite period film – Carol - Brooklyn is a clear hark back to the classic, melodramatic filmmaking of the 40s and 50s. Brooklyn –like Carol – uses its melodrama to great effect, tempering it with the subtle and measured performance by Ronan. The film, based on Colm Tóibín’s much-beloved novel, was adapted for the screen by the incredibly talented Nick Hornby, whose previous screenplays Wild and An Education also focused on unique and daring stories of female struggle and independence. Brooklyn conforms to Hornby’s norm, with its narrative of a young woman discovering herself: Eilis, especially, is a very sympathetic protagonist, with her independent streak depicted as an admirable quality for a young woman, despite the era in which the film is set. There is something overwhelmingly universal about Eilis. In a world where young women are constantly undermined and criticised about everything they say and do, Brooklyn shows us a protagonist who is an outsider in both the worlds she finds herself in. She doesn’t feel at home in Ireland or Brooklyn and struggles to find her purpose. Ultimately, she is a reflection of so many young women who are in limbo about what they want to achieve in their lives between their preordained roles as a daughter and a wife. Brooklyn is far more than a film about the immigrant experience, homesickness and “The American Dream.” It’s a film about taking chances and finding your place in the world. It manages to move the audience to both tears of laughter and tears of joy through its romanticised, classic filmmaking, tied together by the exquisitely subtle and heartbreaking performance from Ronan in a role that she was truly born to play. This entry was posted in Film and tagged film, film review, women. Bookmark the permalink.